Apparently, the new turbodiesel 2007 Range Rover TDV8 is so refined that Land Rover is afraid customers might mistake it for a petrol unit and accidentally fill petrol into the tank, especially if the driver is not a regular user of the vehicle. 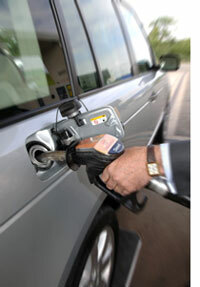 As ridiculous as it sounds, there was over 100,000 cases of mis-fueling reported in 2005. Needless to say, the cost of reversing such a muck-up can be very very painful to your bank account. Which is why Land Rover has come up with something they call the petrol fuel guard system, which comes with the Range Rover TDV8. The petrol fuel guard system activates when a petrol nozzle is inserted into the fuel tank – it differenciates a petrol nozzle and a diesel nozzle by how deep the nozzle goes into the fuel tank – a petrol nozzle is thinner but longer, while a diesel’s is shotter but fatter. If a petrol nozzle is detected, a mechanical shutter is automatically activated, preventing petrol from getting into the fuel tank.